I saw this photo and was immediately taken away to the Driftless. St. Mary's Ridge, near Cashton. Check out this Sheboygan gem from 1990! I can't even describe how much I love this commercial. After a two-year hiatus, I am extremely pleased to announce the revival More Than Curds. Sometimes life just gets in the way and bogs you down, but Erin and I have decided that our love and passion for Wisconsin is something we still want to share with the world. Right now, our plan is to have an update once a month. Of course we have a (long) list of topics we'd like to explore, but if you have an idea or topic you'd like us to write about, please let us know by emailing us at greganderin@morethancurds.com! Thank you for reading, and we hope you'll continue to enjoy our adventures around the best state in the USA. When most people hear the word "snowmobile", they probably think of long stretches of trails through the Northwoods with a 600cc engine humming. And this would be true...most of the time. But some intrepid thrill-seekers wanted to hone their ski-jockey skills year-round. Enter watercross. Watercross, quite simply, is the racing of snowmobiles over open water. Unmodified. The combination of the wide runners on the front of the sled and the powerful treads on the back make the snowmobile hydroplane over the water. It's not unlike skipping a stone over the water. Except the stone is 500 pounds and you throw it 75mph. Some have called it the NASCAR of the Northwoods, but I think that name is misleading. These racers are a lot more insane and awesome. If you crash a car, that's it. If you crash in watercross, you sink. 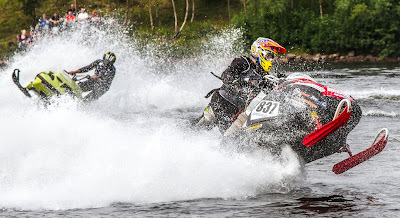 This is a uniquely northern sport that is as thrilling to watch as it is to race. The first organized race was held in the northwestern town of Grantsburg in 1977. The first year was a simple 300ft drag race across Memory Lake. Most racers didn't make it all the way. 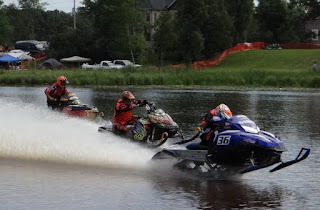 But every year since then, Grantsburg has been hosting the World Championship Snowmobile Watercross. The event attracts hundreds of racers from as far away as Finland and is a weekend-long festival complete with music, beer, and festival food. Drag racing is one thing, but the oval courses are the real test of skill. Steering on the water can only be done by leaning into the turn, adding considerably more risk of sinking. The championship race is eight laps around two buoys. In 2013 Finnish racer Antti Holmberg set the speed record of 112mph. 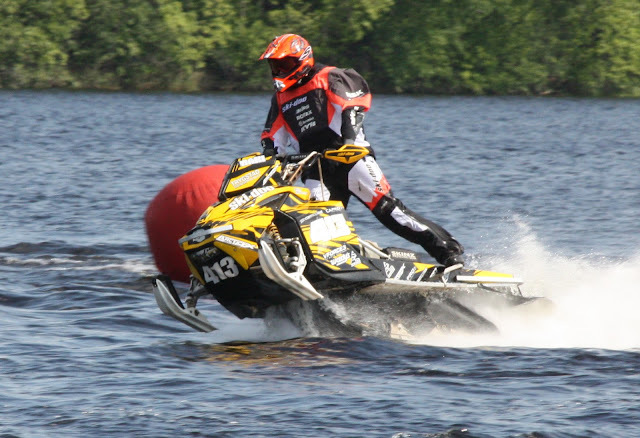 Despite being a popular winter recreation, watercross is illegal in Minnesota. If you'd like to see this for yourself (and who are we kidding, of course you do), you can attend the World Championship Snowmobile Watercross in Grantsburg from July 17-19. If you are unable to attend this outrageously amazing event, I've posted a video of what you are missing. Enjoy. Recently on a jaunt to the cabin Up Nort (you're only two degrees of separation [at most] from a cabin if you know somebody from Wisconsin), we had the opportunity to visit a pow wow hosted by the Waaswaaganing, otherwise known as the Lac du Flambeau Band of the Lake Superior Chippewa. The town of Lac du Flambeau (named Waaswaagani-zaaga'igan in Anishinaabemowin language) is the heart of the Reservation established in 1854 and is still 87% Native American. The name Lac du Flambeau (French for "Lake of the Torches") was given to the area when French fur trappers saw Ojibwe fishing on the lake at night guided by torches on their canoes. The pow wow drew Ojibwe from all over the Upper Midwest and was an impressive sight. The dazzling colors of the clothes; the driving, pulsing rhythm of the drums; and the hypnotic melodies of the songs were spellbinding. The pow wow grounds were along the lake itself and took place as a sunset painted the sky with vibrant blues, purples, pinks, and oranges. There were also vendors cooking traditional meals and selling crafts made by Ojibwe artisans. If you ever find yourself in the summertime Mecca of the Minocqua area, be sure to visit Lac du Flambeau and experience the pow wow for yourself. Wisconsin's first people are a rich and vibrant part of the cultural fabric of our state. When I travel Wisconsin, I enjoy to take the back roads. Not only is the landscape more beautiful, but sometimes you'll find something unexpected and wonderful. Case in point: Woodman Brewery. I was driving from Prairie du Chein to Madison one day when I started to get a little peckish. I knew I should've grabbed a muffin from the breakfast bar at the hotel, but I was in a rush. As I drove down Highway 133, the Wisconsin River flowing to my left, the gentle forested hills of the Driftless to my right, I approach the hamlet of Woodman. And there, right in the middle of town, as if to answer all my prayers is the Woodman Brewery. I opened the screen door and walked in to an empty horseshoe bar. At the other side of the room is the brewhouse--if you can call it that. It was barely more than a walled-off kitchen with some large kettles on a stove. This made One Barrel Brewing look like New Glarus. Looking around, this is your typical small-down dive. Electronic dart boards, pool table, big-screens for the Packers. But the beer on draught was a step up. Not a Michelob to be found. Only the mad brews of a beer-frenzied mind. Suddenly, I'm greeted by Dennis Erb, the owner/brewer/frenzied mind of the operation. I sit down, he grills up a mighty tasty burger, and we start chatting about the beer. Dennis is pushing for a more unusual line-up. At Woodman, you'll find beers such as a red ale infused with rose pedals, a white stout, and a rye-based IPA. A lot of his beer feature infused flavors: peanut butter porter, jalapeno blonde, molasses bock, French onion saison, and a teriyaki rice lager. Some of these flavors were a bit awkward but the ones that worked, worked really well. For a town of 132, this was a serious operation. All-in-all, Dan has 16 available on draft. I made sure to bring home a sixer. Woodman Brewery might not be the most upscale brewpub in Wisconsin, but it sure was a welcome sight for a beer-loving, road-weary traveller looking for lunch. It's good to know that small towns in Wisconsin are starting to go back to the old ways of supporting the local brewer. After all, isn't variety the spice of life? Wisconsin has a wide range of beautiful landscapes and off-the-beaten-path places to see. What better way then Wisconsin's scenic byways? In that spirit of adventurism, I am starting a new segment for More Than Curds: Our Favorite Drives. Start your day just off just south of Shullsburg on Highway U. Follow signs and you'll find the Gravity Hill. Throw your car in neutral, and it'll begin rolling uphill! Next, head up to 23 and you'll see Roelli Cheese Haus. This is a small, artisan cheese plant owned by the same Swiss family for generations. Stop in to pick up some of the best Wisconsin cheese in the state! Our recommendation? The Dunbarton Blue is great with almost any beer in Wisconsin. Keep driving north and enjoy the view. You'll drive through some of the gently rolling hills of the Driftless landscape. This area is hope to happy cows and beautiful vistas of traditional family farmland. Soon, you'll reach Mineral Point. This exceedingly quaint town is home to a brewpub, cheesemaker, amazing Japanese cuisine, Wisconsin's Cornish history, and a slew of art galleries and studios. Take your time and wander the granite-built streets of this near 200-year-old town. Onward. On your way north, you'll soon run into Dodgeville. Dodgeville is home to Wisconsin's oldest courthouse, and Land's End clothing. Stop by the Land's End outlet for some amazing clothing deals, then explore Wisconsin's mining heritage. Dodgeville is also gateway to Governor Dodge State Park (one of my personal favorite hiking and camping spots in the state). Leaving Dodgeville, you'll find some interesting sights along the road. On the left is the Don Q Inn, the charmingly eccentric hotel with the Boeing C-97 in front. Farther north, the road will dip and twist more as the hills express themselves through the forested landscape. 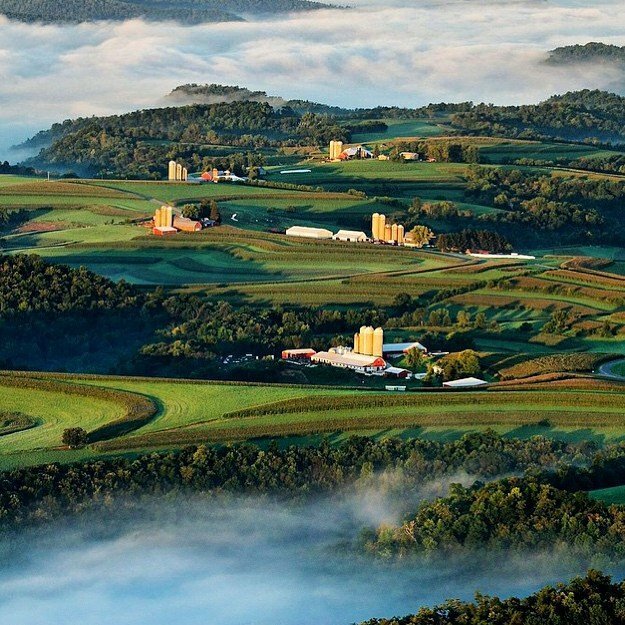 On the ridges, you'll see spectacular vistas of the Driftless, speckled with red barns and black cows grazing on the pastures. Eventually, you'll come across The House On The Rock. 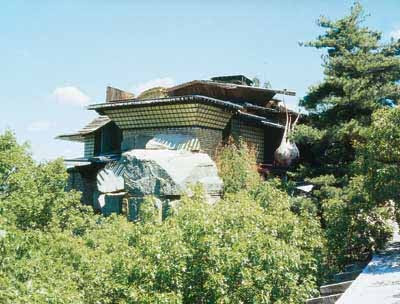 Built by Alex Jordan Jr. in 1959, House On The Rock is now one of the most famous attractions in Wisconsin. Some may call it a tourist trap, but I'll let you decide that for yourself. If bizarre collections in a nonsensical house doesn't appeal to you, maybe you're just at the wrong house. Not much further up 23 is a house of international fame. 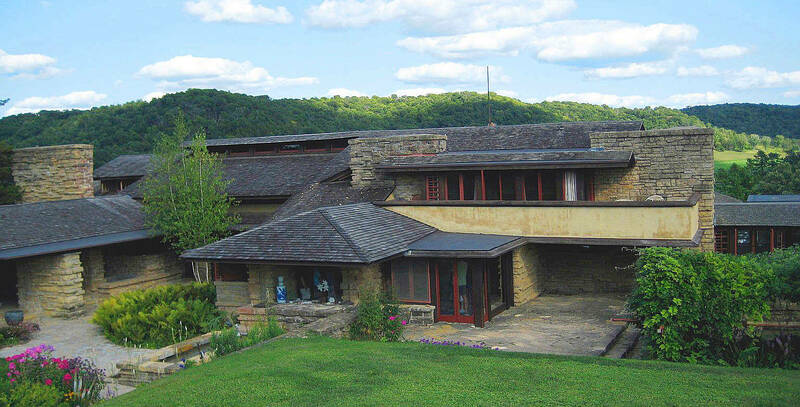 Designed by Wisconsin's own Frank Lloyd Wright, Taliesin was the personal home of the architect. Truly a spectacular work of art, the house is just south of Spring Green. Spring Green is also home to American Players Theatre. I'd recommend stopping at the Driftless Depot for local provisions before enjoying open-air productions of Shakespeare and other greats. There is a lot more to see on Highway 23. 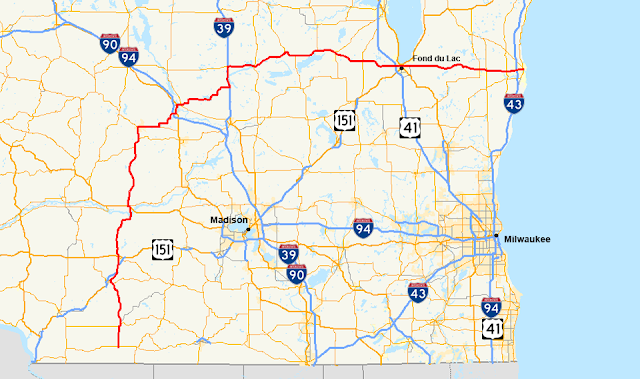 The ride to Reedsburg will reveal soaring hills and cool valleys, and cutting across Wisconsin to Sheboygan will open up to the prairie plains, but the southern leg of 23 is always my favorite. Rememebr: it's not the destination, it's the journey. A recent piece by our friends over at Wisconsin Life. Probably one of the most succinct summaries of why we love our home so much. This weekend is Syttende Mai, which commemorates Norway's independence from Denmark in 1814. There are impressive Styyende Mai celebrations happening in Norwegian neighborhoods throughout the state but, if you happen to be in southern Wisconsin, the city of Stoughton throws an awesome Syttende Mai shindig that dates back to 1868. Skal, y'all! For our four test batches, we used a few strains of brewer's yeast, hops, and various grain blends. We purchased these supplies at the Wine and Hop Shop on Monroe Street in Madison, WI. This morning at 6am, we drove up to Willow Creek Cheese in Berlin, WI. The owners generously donated two, five-gallon buckets of fresh goat's milk whey for our Viking blaand experiment. Thanks, Willow Creek Cheese! The whey doesn't look like much. Two big buckets of glossy white liquid. If you have cats, watch your back when the lids come off of the whey buckets. We managed to snap this shot without any feline tampering, but it must smell like cat ambrosia. Two buckets of fresh goat's milk whey from Willow Creek Cheese in Berlin, WI. We reduced the whey in a propane powered turkey fryer. 1) Straight-up blaand: Containing only reduced whey and lambic blend yeasts. 2) Milk Stout: Traditional recipe with reduced whey substituted for brew water. 3) Milk Stout with lambic yeasts: Traditional recipe with reduced whey substituted for brew water, plus the addition of lambic yeasts. 4) Scotch Ale: Traditional recipe with unreduced whey substituted for brew water. After a day of brewing, all of the batches are in the fermenters and ready to go. Friends who've heard about this project have joked that we should take the fermenters on a canoe trip in order to add extra authenticity but, for now, they're stashed safely in the basement. Some of the lambic batches will age for close to a year and we'll uncork them during Syttende Mai 2014. The hybrid batches will be ready to sample in a few short weeks. If there are any brave Madison-based readers who want to give this stuff a whirl, let me know in the comments! Yes, we are More Than Curds. But does that mean we should shun our beloved dairy form our blog? I think not. Although we here at MTC strive to bring you an overview of Wisconsin that reaches far beyond the simplistic cheese, beer, and Packers stereotype, we also must admit that we really love our cheese, beer, and Packers! So having said that, I present you one of our most traditional and unique cheeses from Wisconsin: Limburger. Yes, Limburger. The name alone will conjure images of cartoon mice that won’t eat the infamously stinky cheese. But I believe that was drawn by one who has never tasted the amazing taste and texture of Limburger. Yes, it has a pungency to it, but Limburger is fantastically delicious. And it’s only made here in Wisconsin. At one time, Limburger was a favorite working-man’s cheese and was produced by about 25 cheese factories, though it’s popularity waned as the American palate for cheese favored bland, mass-produced cheeses that didn’t require much care. We begin driving south, to Monroe. Limburger, although originally from Germany (or Belgium, depending on who you ask), is now only traditionally made by hand in one place: Chalet Cheese Cooperative. Myron Olson, the only Master Cheesemaker in Limburger in the world, is our guide. This man is so into his Limburger that even his license plate sings its praises. The Chalet Cheese Co-op was founded in 1885 by five farmers as a cheese co-op and still operates as a co-op with 21 family farms today. Myron got his start in the factory as a janitor when he was in high school and worked his way up into the age-old craft of cheesemaking. The Co-op brings in 100,000 pounds of milk (roughly 11,000 gallons) a day, which might sound like a lot, but is actually quite small for a cheese factory (some larger plants are processing over two million pounds a day!). The cheese is pasteurized and then taken to the vat for coagulation. Bacterial cultures and enzymes are added to separate the curds from the whey (at this point you have what is essentially cottage cheese). 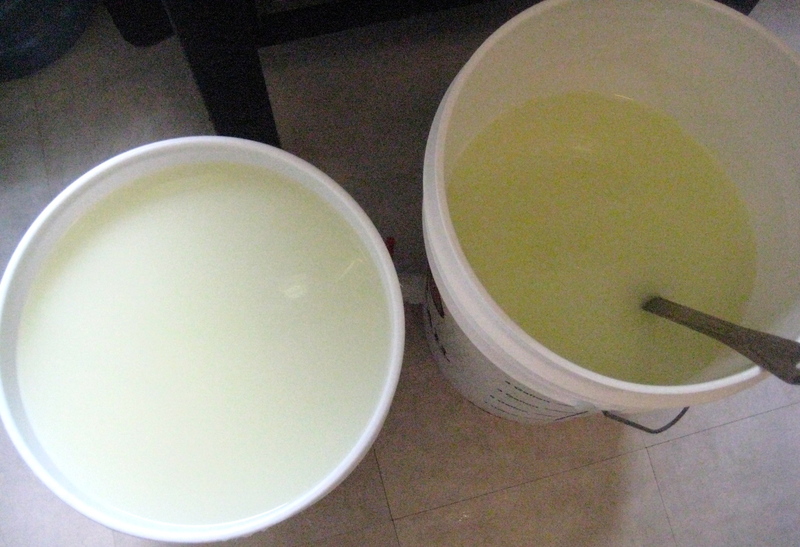 The whey is drained and the curds are pressed into small blocks. Once the blocks are formed is when the real magic happens. Unaged Limburger is a lot like Feta: salt and crumbly. To produce soft texture, buttery flavor, and pungent aroma the cheese must be ripened in a special aging room. They get a bath of special bacteria and yeast which works on breaking down the proteins in the cheese. Only at Chalet is this done by hand. The room is kept at a cool 50 degrees with about 80% humidity. When the cheese plant moved to its current location in the 1960’s, they found that the cheese wasn’t ripening properly. They went to the original plant and brought in a few of the pine boards from the old aging room and found that the natural cultures in the wood is what did the trick! They still use this same culture as when the plant opened in the 1880’s. Myron is the last Limburger maker in the country, though he is starting to see its popularity come around. Most people born after 1960 don't care for the full-flavored cheese, but as artisinal cheese becomes more popular, he's hoping Limburger will too. Maybe it's just the name--if was named "Olson's Private Reserved Washed-Rind cheese", then maybe more people would be more likely to try it! Young Limburger will have a mild flavor and firm texture. As it gets older, the texture will soften and the smell will get really intense! For beginners, I usually serve a medium Limburger with the rind cut off. The way my German grandpa and I eat it is old and smelly! For a true Wisconsin lunch, serve it on pumpernickel rye with Dusseldorf mustard and raw onions. All washed down with a beer, of course! Recently, More Than Curds was asked to help judge the 2013 World-Wide Mustard Competition at the National Mustard Museum. The Museum is located in Middleton, WI and stocks hundreds of varieties of mustard that curious patrons can sample and purchase. On the day of the judging, roughly 60 individuals showed up to taste and score mustards for the preliminary round of championship judging. Our very own Greg Long and Erin Ellison were among the lucky participants! This was the most popular judging strategy: the spoon starburst. Most people are familiar with yellow mustards and spicy Dijon, but the Mustard Competition presented a whopping 16 categories of mustard to be sampled and critiqued. The mustards in question were entered by mustard makers from countries all over the world including: Australia, New Zealand, Japan, South Africa, Poland, Germany, Sweden, France, England, and Canada. The mustard categories were as follows: SWEET-HOT, HONEY MUSTARD, CLASSIC DIJON (SMOOTH), WHOLE GRAIN/COARSE GRAINED, CLASSIC HOT, PEPPER HOT, HORSERADISH/WASABI, HERB/VEGET ABLE, GARLIC, FRUIT, SPIRIT, AMERICAN YELLOW, DELI/BROWN, EXOTIC, MUSTARD BASED SALAD DRESSINGS, and MUSTARD BASED BBQ SAUCES, GLAZES, OR MARINADES. Erin and Greg were in the group of judges who sampled coarse mustards (a great category because of the wide variety of flavors and textures), and the ill-fated hot mustard category. The coarse mustard category was so expansive that there were nearly 40 entries to be scored. All mustards were presented on a platter in small plastic containers. Each container was labeled with an anonymous post-it label for impartial judging; however, if a participant was really curious about a particular entry, the "mustard grand master" would divulge the name of a mustard after that category had been judged. Some competing entries were even available for purchase in the museum gift shop. Most judges started out the afternoon feeling pretty enthusiastic about mustard. But by the end of the day, the thought of bringing home a jar of mustard (or even consuming the condiment in the coming week) was off-putting. If there's such a thing as a mustard overdose, Erin and Greg certainly experienced it. Most of the hot mustards hailed from Asia and were insanely spicy. After a few samples from this category, members in the judging cohort began sweating and chugging water like it was going out of style. All sinus cavities were cleared out after this round of judging! The hot mustards are not for the faint of heart. The final round of mustard judging will wrap up at the Milwaukee Public Market in Milwaukee, WI. If you have any interest in being a judge for the 2014 World-Wide Mustard Competition, please apply through the National Mustard Museum's website. © All content copyright 2015 by More Than Curds. Awesome Inc. theme. Powered by Blogger.